From Talk Less, Say More Blog, click above to jump there. Have you seen this directive online? I did, December of 2012. I thought it would be a great way to celebrate the good things that happen in life, but I often forget happened. I also thought that it would be a way to 'hunt the good stuff' everyday, find *at least* one thing that day that was positive. 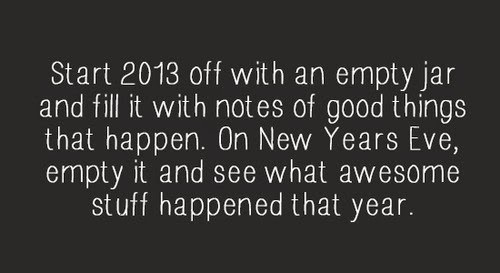 I set out to do this for the whole of 2013. 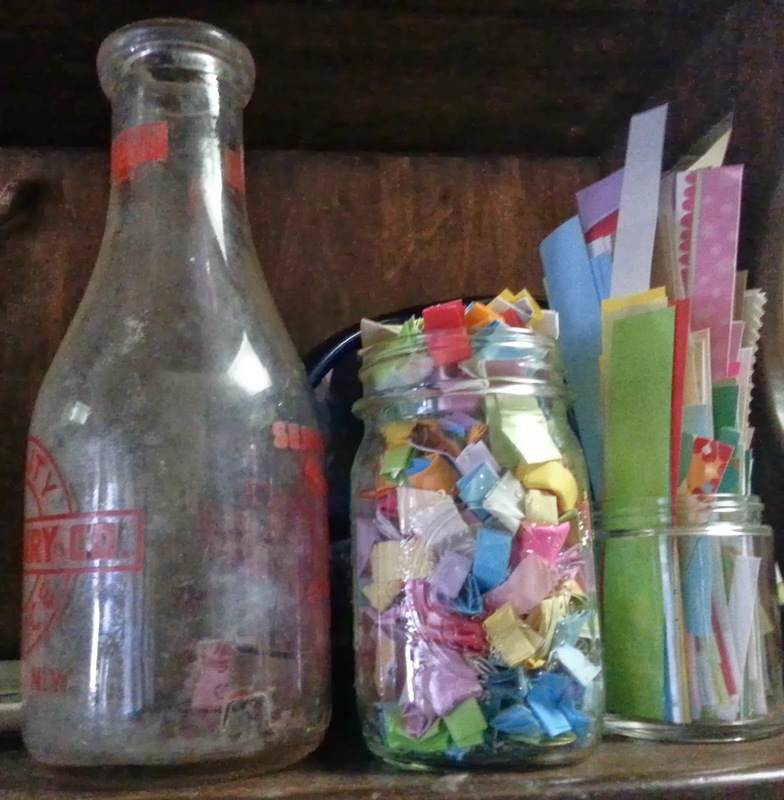 I put out an antique milk jar on a shelf at eye level, in the kitchen, next to a spot I walk by about 200 times a week, so I would see it EVERYDAY. I cut stripes of brightly colored paper so all the good things had a happy place to live on. I was mindful during the day to search out the good stuff in my everyday life. I would try to jot the one thing down at night. I made up a rule for myself: at least one thing per day. Not just when good things seem to happen, but *everyday. * I was set. I was ready for The Hunt! Some days it was so easy. 'Long lunch with an old friend', 'Worked on the project for a new client', 'Spa world', 'Made some yummy homemade soup', 'Met my friends' new baby! ', 'Delivered project to client' are just a sampling of the types of things I would write down. Even as I walked and talked though my life, I might think "this will be my thing for today". It was working. The jar started to fill with happy, colorful life. I was hunting -and finding- the good stuff. Early in the year, I had a particularly great day where six fantastic things happened. I was overwhelmed by having six individually good things to write down! Was this too good to be true? Was this a look at things to come in the future? Could my life be counted on to create many more than one good thing a day? Some days, it was all I could do to find one thing. During stressful periods, it was down right hard. I fakebook like a pro, but I felt that this would be lying to myself to fudge my 'good thing'. I remember one day that I wrote down "Nothing truly bad happened today" because that was the silver lining I could find. I hit a rough patch in July, right as the heat of the year was ramping up, I was winding down. I had a sudden break up that left very little mental energy to Hunt. I listened to "Summertime Sadness" by Lana Del Ray more times than was healthy, wanted to wear red and have big hair (humidity obliged). I felt that I tried, but just didn't care about the project anymore. How many times can one be 'happy' that she got through the day without crying? So, I loosened my hold on my rules and didn't force myself to find one good thing per day. 'Got through the meeting without yelling at anyone', 'Didn't cry today', 'Only played sad songs for one hour' were a sampling of the good things from this time. The fill line in the jar leveled out and stayed pretty stagnant for a while. Looking back, this was the most pressing time to be practicing hunting the good stuff. When you can't see it right in front of you, you have to dig a little deeper to find it. That's what I should have been working on. But, I just didn't care. As time flowed, I came back around to The Hunt everyday. I let it slide if I forgot for 3 days straight, but might triple up if things were going my way. The project didn't feel oppressive and false, but a positive thing again. I was more relaxed about it and felt it becoming more natural. I have always been a 'let's look at this another way' type of person, so I just had to tap into that, especially in a productive way. End of the year craziness ensued and there was little time to even jot one line down, but I continued through the end of the year. I didn't remember the part of the directive that stated you should read all the awesomeness on New Years Eve. For some reason, I thought it was that you should read one of the good things from last year each day of the next year. So, when I went away for New Year's Eve, I didn't bring all my papers with me and actually didn't figure this out until I just looked for the photo above. I came home thinking I would read one slip of paper a day. I wanted to transfer the little bits into a different jar and use the same one for the current year, trying to fill it up more this time. However, when I moved the paper, the jar I selected, the only one I could find that was seemed remotely big enough, was not, in fact big enough. As I planned to slowly empty this container, it didn't seem important that they didn't fit. Later, it struck me as poignant that when viewed by one standard, the larger jar, my life last year didn't have as many good things as I would have liked. Viewed from a different standard, the smaller jar, my jar runneth over with good things. My universe is small, my reach quite literally the people I hug. My jar can be as big or as little as I make it. I just have remember that no matter what size, no matter how 'few good things', my cup will always run over with the good stuff I will continue to hunt, because I will make it so. Ready to join The Hunt?